The kids and I love shrimp, but I think I’ve told you that before. I also think I’ve already told you about how they cheer when they see that I am making a shrimp dish. Clearly, we like ’em. And lately, we’ve been eating a lot of shrimp. I buy frozen raw shrimp and defrost it under running cold water (takes about 10 minutes) and then peel. I usually remove the tails, if the kids will be eating with me, since it’s easier for them not to have them on. But you can totally enjoy them with the tails on too. 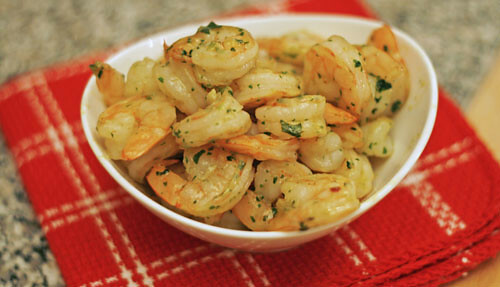 This particular shrimp dish cooks fast on the stovetop with a bit of olive oil, garlic and parsley. It’s infused with flavor and finished off with just a bit of salt. The shrimp are flavorful, but not overwhelming — perfect for eating with crusty bread and a crisp green salad. I highly suggest that you use the bread to sop up some of the juices from these. It’s that good. Heat the olive oil in a 10″ skillet over medium heat. Add the garlic and parsley and cook for 1 minute. Add the shrimp to the skillet and toss to combine. Cover, and cook until the shrimp are opaque (4-5 minutes). Uncover and cook for an additional 1-2 minutes. Serve. 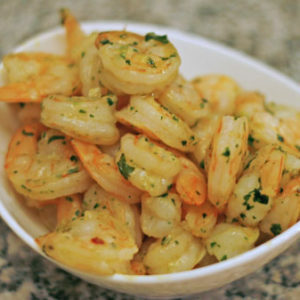 I love shrimp too.. i would like to toss these shrimp with some pasta or maybe eat it with rice to get all the juicy goodness!!! yum! 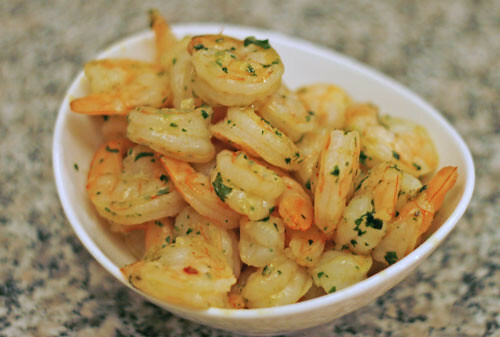 Lol, given the amount of shrimp dishes that can be found on my blog, I think I would fit in really well with your family!